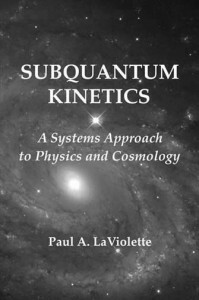 The book by Paul LaViolette is a serious scientific study which examines the problem of the interaction of solid bodies and electromagnetic fields with the physical vacuum, taking into consideration an extremely large portion of the theoretical and experimental knowledge of modern physics. The need for this book has existed for a long time because an enormous volume of experimental data accumulated during the last half of the century in physics, chemistry, cosmology and material science does not fit the concepts of the more familiar theories of quantum mechanics, plasma physics, superconductivity, light as well asEinstein’s general and special relativity theories. The scientific world in the 21st century continues to develop in accordance with the laws of dialectics, the general volume of data in the field of physics eliciting a transformation wherein quantitative changes evoke qualitative ones to result in new theories. One of these overwhelming theories is the theory of the “physical vacuum” or ether, in other words the theory proposing that sub-atomic particles fill all the space around us and actively interact with material objects and fields, changing their properties, energy, and speed, and directly influencing physical and chemical reactions. The appearance of such terms as physical vacuum, vacuum polarization and vacuum energy fluctuations was met by many scientists as a challenge to existing theories and for many years these terms were not accepted by official science. Many aspects of the statements about the physical vacuum were considered to contradict the “logical statements” of quantum mechanics, Einstein’s theory and the Second Law of Thermodynamics. At the same time physicists preferred not to discuss the well known and extremely great contradictions that exist between quantum mechanics and Einstein’s theories. As all modern electronic science is based on quantum mechanics and as nuclear energy is based on Einstein’s formulas, both of these approaches were considered flawless and attempts to explain the mechanism of physical phenomena in terms that have used new approaches, have been punished severely. The book on subquantum kinetics by Paul LaViolette is one of the first profound works in this field. Usually the analysis of the corresponding material requires complex mathematical equations, and many articles typically contain an abundance of integrals, which doesn’t always help to reveal the essence of the physical phenomena. A great merit of Paul LaViolette is his ability to discuss the main features of the subatomic world without using complex mathematics and while preserving a rigorous logic in his arguments and conclusions. That doesn’t mean that the book is primitive. On the contrary, in order to understand the full scope of the discussed phenomena, it is helpful to have a profound knowledge of solid state physics, electricity, optics, chemistry, and elementary particle physics. On the other hand, if we analyze this book taking into consideration only well-known scientific facts, it may seem that the problem of subquantum physics doesn’t exist. Up to the present, vacuum has widely been regarded as an absolutely empty space or nothing. Students were taught using this approach, many Ph. D. degrees were earned, and everything seemed to be fine, but frankly speaking, there has been little progress in the field of physics during the past 40 years. Meanwhile, the communication with spacecraft on the surface of Mars is based on electromagnetic waves. The wave, by conventional definition, is a distortion of space; if there is no space, there is nothing to distort. According to Einstein, gravitation is a geometrical bending of space-time, and we accept it. But if space is absolute emptiness, it is impossible to bend it. This is pure logic. But if we refer to the handbook for physics, we will find that an empty vacuum has more than 10 different characteristics, including a dielectric constant, modulus of elasticity, magnetic permeability coefficient, magnetic susceptibility, modulus of conductance, a characteristic electromagnetic wave impedance of 377 Ohms, and other values. Isn’t that much for an absolutely empty space? In autumn of 2002, there appeared a book by Dr. Bearden “Energy from vacuum” having a length of 977 pages and it has become a bestseller in the scientific media, despite its price of over 100$. Thomas Bearden, retired colonel, who has diplomas in nuclear physics, mathematics, and engineering, presents an analysis of 30 years of his studies in the field of new technologies and energy production. The impact of this work is great and it’s influence on modern readers can’t be denied, but with all its good qualities, this book is more a popular than a scientific one, and the author didn’t have the intention of giving a profound scientific approach. Although the book by Paul LaViolette, , doesn’t contain nice color illustrations, it nevertheless concentrates on the scientific analysis and comparison of mechanisms and interactions between sub-atomic particles and ordinary matter and is therefore an extremely important and useful tool. This book teaches us how to think about and understand the physics and the nature around us, and more importantly – this is just a beginning, one that provides the basis for further development, further study, and new experiments, following a systematic and scientific approach. There is no doubt that this book is an outstanding contribution to modern physics and that it will receive the attention and appreciation of many thankful readers.